A rich woman, Mrs. Li, is losing her attractiveness and longs for passion with her husband, who is later revealed to be having an affair with his younger and more attractive masseuse. In order to boost her image, she seeks out the help of Aunt Mei, a local chef. Mei cooks her some special dumplings which she claims to be effective for rejuvenation. From the very beginning, Mrs. Li was aware that Mei used unborn fetus "imported" from the abortion clinic where Mei used to work. She keeps seeking more potent remedies, until one day she is in luck: Mei had just performed a black market abortion operation on a schoolgirl five months pregnant who has been impregnated by her father. After Mrs. Li sneaks a look in the kitchen and sees the fetus, she is initially outraged and runs away, but later comes back. Mei makes the fetus into dumplings, which Mrs. Li devours. This has a wondrous effect on her libido as she goes into the hospital and makes love with her husband. In a short flashback, we are shown the girl and her mother riding a bus home after the abortion. After getting off, the girl collapses on the sidewalk. With no one around, the mother can only watch as her daughter slips into unconsciousness. Muttering her last words, "I don't want to die..." she dies soon afterwards, presumably from a ruptured uterus due to having her baby aborted too late in her pregnancy . Mrs. Li hosts a dinner party for her friends, who compliment her and wonder about her new-found beauty and looks. When she joins them, they claim there is a horrid fish-like smell in the air, which turns out to be from Mrs. Li herself. She excuses herself from the table and runs to the bathtub. Furious with Mei, Mrs. Li calls her, demanding what she has ingested. Mei merely claims that an inbred child of an incestuous relationship is the most potent. Curious at what his wife is yelling about, Mr. Li gets on the other line and overhears the conversation between her and Mei about what happened, and pays the latter a visit, inquiring into whether it really works. Mr. Li eats one of her dumplings and makes love to Mei, whom he finds out to be 64, but with the body of a slender 35 year old. She attributes her looks to her cannabalism. 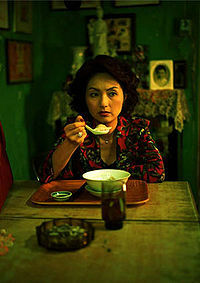 Soon, Mrs. Li realizes that she cannot stay young without eating Mei's dumplings. Ignorant of the fact that her husband cheated on her again for Mei, she pleaded the latter to continue to find her the most potent ingredients for the dumplings and promises to pay her handsomely. Presumably a mistress of Mr. Li at that point, Mei ignored Mrs. Li's plea and tore her cheque into pieces. The next morning, police officers arrive at an apartment, where they find the mother, crying, bloodied and clenching a knife. Upset about her daughter's death, she has stabbed her incestuous husband to death. It is implied that upon finding the wife and the dead husband, the police find out Mei's identity and raid her apartment. Mei, however, has already fled. It is revealed that Mr. Li has impregnated his masseuse. When Mrs. Li catches word of this, she tracks down the pregnant masseuse, planning on having her abort the fetus. Although the young masseuse is comfortable with her pregnancy and wishes to have the child, Mrs. Li convinces her to have it aborted in exchange for a large sum of money. Mrs. Li insists to the doctor that the baby should come out alive. Mrs. Li then takes the fetus and turns it into dumplings, ingesting her husband's child. Mei, we learn, has been degraded to sell dumplings on the streets in Shenzhen.